Im Rahmen unseres aktuellen Themenschwerpunkts zur Meeresspiegelforschung wollen wir Ihnen heute einige weitere interessante Arbeiten aus Nord- und Südamerika vorstellen, bevor wir dann im übernächsten Teil unserer Serie in die Südsee reisen. We analyze a set of 20 tide gauge records covering the contiguous United States (US) coastline and the period from 1929 to 2013 to identify long-term trends and multidecadal variations in extreme sea levels (ESLs) relative to changes in mean sea level (MSL). Different data sampling and analysis techniques are applied to test the robustness of the results against the selected methodology. Significant but small long-term trends in ESLs above/below MSL are found at individual sites along most coastline stretches, but are mostly confined to the southeast coast and the winter season when storm surges are primarily driven by extratropical cyclones. We identify six regions with broadly coherent and considerable multidecadal ESL variations unrelated to MSL changes. Using a quasi-nonstationary extreme value analysis, we show that the latter would have caused variations in design relevant return water levels (50–200 year return periods) ranging from ∼10 cm to as much as 110 cm across the six regions. The results raise questions as to the applicability of the “MSL offset method,” assuming that ESL changes are primarily driven by changes in MSL without allowing for distinct long-term trends or low-frequency variations. Identifying the coherent multidecadal ESL variability is crucial in order to understand the physical driving factors. Ultimately, this information must be included into coastal design and adaptation processes. Although much of the focus on future sea level rise concerns the long-term trend associated with anthropogenic warming, on shorter time scales, internal climate variability can contribute significantly to regional sea level. Such sea level variability should be taken into consideration when planning efforts to mitigate the effects of future sea level change. In this study, we quantify the contribution to regional sea level of the El Niño-Southern Oscillation (ENSO). Through cyclostationary empirical orthogonal function analysis (CSEOF) of the long reconstructed sea level data set and of a set of U.S. tide gauges, two global modes dominated by Pacific Ocean variability are identified and related to ENSO and, by extension, the Pacific Decadal Oscillation. By estimating the combined contribution of these two modes to regional sea level, we find that ENSO can contribute significantly on short time scales, with contributions of up to 20 cm along the west coast of the U.S. The CSEOF decomposition of the long tide gauge records around the U.S. highlights the influence of ENSO on the U.S. east coast. Tandem analyses of both the reconstructed and tide gauge records also examine the utility of the sea level reconstructions for near-coast studies. Over the past 2,300 years Sitkinak Island in the Kodiak Archipelago has repeatedly risen above the waves and been plunged into the ocean as the Alaska-Aleutian megathrust fault underlying it ruptured. Using a variety of observational techniques, Briggs et al. tracked the changing elevation of Sitkinak Island, in the process uncovering a previously unstudied history of the fault. Variable sediment accumulation rates in cores collected in Guanabara Bay, Rio de Janeiro State, indicate that filling of the bay started before 6000 years ago and that it was not uniform through time. 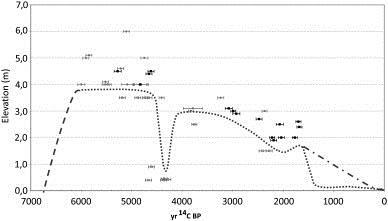 Comparison of these variable sediment accumulation rates and sea-level fluctuations over the last 5500 years suggests a linear relation between them. The sea-level drop between 5500 and 5000 years ago, for example, corresponds to higher accumulation rates between 5130 and 4350 calendar years BP. At this time, the sea-level change from 5 to 2 m above present sea-level caused a drop of wave base level and consequently an increase of sediment supply to deeper parts of Guanabara Bay. Between approximately 4350 and 2000–1800 years ago sea level became stable with consequent reduction in the accumulation rate. From this time until approximately 500 years ago accumulation rates increased again because of another sea-level drop from 2 m to the present sea-level. The rate of the second sea-level drop was not as high as the first one, and neither was the accumulation rate increase. Although radiocarbon dates suggest a dramatic reduction of accumulation rates between ~ 4000–2000 years ago, estimates for the last 150 years based on 210Pb indicate a progressive increase in the accumulation rates despite the presumed stability and perhaps even a small elevation of modern sea-level in the last 150 years as deduced from tide gauge records. Accumulation rates increase from 0.14 cm·yr− 1 to 0.49 cm·yr− 1 for the period of 1922 to 1951 and reach 0.60 cm·yr− 1 from 1963 to 1993. In the last five years accumulation rates double, increasing from 0.60 cm·yr− 1 to 1.25 cm·yr− 1. These higher accumulation rates during stable or rising sea-level are likely due to local increases in deforestation, expansion of farming land, dredging of channels, and increased paving of roadways. A curve of the relative sea level during the Holocene in Uruguay was constructed based on data from beach storm deposits. The error envelope was too great to register small but significant oscillations, but the number of points used and the coincidence between our data and that from the literature show that in Uruguay the sea level was above the present level approximately 6000 years BP and has been declining since then. The non-parametric smoothing technique used favours a smooth declining sea level curve similar to that proposed for the coast of Brazil (different slope). In the present study, we carried out pollen, diatom and other palynomorph analyses from a sedimentary sequence from the marshes of Arroyo Solís Grande, in the Río de la Plata northeastern coast (Uruguay), and compared the results with a regional model of surface pollen–vegetation relationship from the Atlantic coastal salt marshes (30°–37° S). Results indicated that salt marsh vegetation developed around the estuary between 8000 and 5100 cal yr BP, as the sea level rose and reached the Holocene sea-level highstand. Brackish marshes around the estuary between 5100 and 2900 cal yr BP reflect the late Holocene sea-level fall and associated increased input of freshwater. Brackish marshes and shallow salt pond environments between 2900 and 1000 cal yr BP are most probably linked to the Paraná delta formation and a further sea-level fall. Present-day marshes behind the sand bar characterize the last 1000 cal yr BP. The integration of our results with multiproxy records from the Río de la Plata southern coast (Argentina) and from the coastal plain of the southern Atlantic margin of South America (30°–37° S) revealed that marine influence during the maximum sea-level highstand resulted in the development of vegetation similar to that of the geographical region. However, after ca. 3000 cal yr BP, local differentiation related to different climate and geomorphology occurred at each area, thus resulting in the establishment of different modern plant communities at different times during the late Holocene.